From the epoch of the Great Depression when the pulps were in full bloom, among the millionaire playboys who donned masked avenger garb, there were the super spies from Secret Agent X to those in Thrilling Spy Stories. It is with great pleasure then that Moonstone Books presents Day of the Destroyers, an all-original prose linked anthology. Each story is part of a larger arc wherein Jimmie Flint, Secret Agent X-11 of the Intelligence Service Command, battles to prevent the seditionist Medusa Council from engineering a bloody coup overthrowing our democracy. Inspired by actual events from the 1930s, alluded to in the recent Roosevelts: An Intimate History PBS documentary, a grouping of extremist politicians and moneyed interests sought to "take back" the country from President Roosevelt. Day of the Destroyers pits the ever-resourceful Jimmie Flint against these forces. He fights across the country preventing an aerial assault on Chicago’s rail lines, destroying a secret factory of gas meant to enthrall millions in New Mexico, to racing to stop a machine of fantastic destruction in Manhattan. 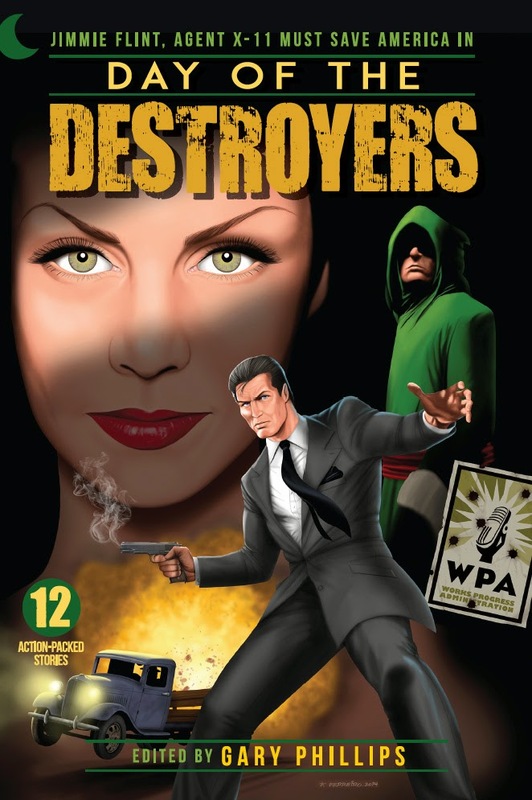 He’s aided by his girlfriend, intrepid newspaper reporter Kara Eastland, his teenaged protégé Tim Fallon, as well as pulp era masked vigilantes the Green Lama, the Phantom Detective, and the Black Bat. Joining the fight are real historical figures including General Smedley (the original Devil Dog) Butler and war correspondent Martha Gellhorn. Each exciting chapter-story in the anthology builds to a final showdown between the redoubtable X-11 and his arch-nemesis, Colonel Lucian Starliss, head of the Medusa Council. Writers who contributed to this one-of-a-kind collection are Pulp Factory award winner Adam Lance Garcia, Macavity and Shamus nominated Jeri Westerson, pulpmeisters Tommy Hancock and Ron Fortier, former Marvel Comics editor Eric Fein, Zeroids writer Aaron Shaps, former LAPD lead detective Paul Bishop, Moonstone EiC Joe Gentile, and Chester Himes award winner Gary Phillips. Introduction by Pulp Ark award winner Bobby Nash.